Dropping levels of student engagement in the United States and Canada has become a crisis - with 46% of high school students reporting they are bored in school (USA), and only 45% of grade 12 students reporting that they are intellectually engaged (Canada). 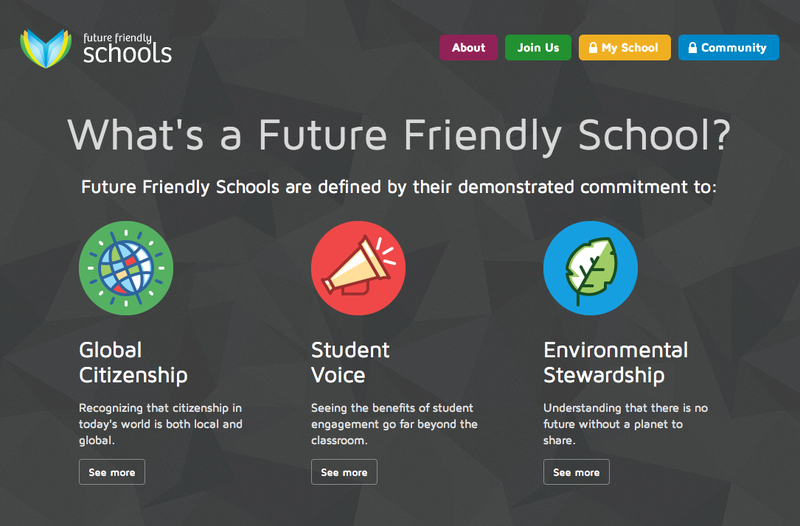 TakingITGlobal has developed Future Friendly Schools, a crowd-sourced framework empowering any school to increase student motivation and engagement, by embracing the proven values of global citizenship, student voice, and environmental stewardship. TakingITGlobal (TIG) develops innovative programs in the areas of Digital Youth Engagement, Global Education, and Social Innovation. We empower youth to understand and act on the world’s greatest challenges. Often described as a "social network for social good," the tigweb.org online community is available in 13 languages and offers a diverse set of resources and action tools to inspire, inform and involve youth in positive social change. TakingITGlobal for Educators (TIGed) connects more than 4,000 schools in over 140 countries, providing school certification and accredited professional development to support educators in fostering global citizenship among their students. Our Sprout social innovation program offers training courses and events for aspiring social entrepreneurs, with corporate partnerships connecting graduates to mentorship and seed funding. Founded as a charity by two young Canadians in 2000, the TakingITGlobal platform has reached more than 40 million people who have accessed the website to learn, grow and realize their potential. TIG’s Online Community connects more than 500,000 individual members, 25,000 civil society organizations and 4,000 youth led projects to engage and collaborate in activities to promote positive social change. Today’s schools exist in a connected yet troubled world, and the demands placed on them have never been higher. Our world and its problems are increasingly complex and complicated, putting pressure on schools to produce problem solvers driven to contribute to positive change. Schools are mandated to impart “21st century skills” as well as the traditional “3 Rs” of reading, writing, and arithmetic, and to produce strong results in standardized testing and competitive global studies. They are also expected to quickly and creatively integrate new tools and technologies, while effectively guarding against threats such as cyberbullying. Unfortunately, change in education systems is notoriously slow and challenging, as schools find themselves constrained by budget limitations, curriculum requirements, regulations, legal considerations, and policy agendas. Because of these and other challenges, few schools are able to deliver on what is asked of them. Even worse, many schools are struggling just to engage students in their learning. In many countries, students are dropping out of school at alarming rates — despite large budgets and significant investments in classrooms, teachers, and technology. While there is no one reason for abandoning school, a growing body of research demonstrates that a perceived disconnect between school and the “real world” is a common motivator. The problem is often not that students are not capable of academic success or even that they don’t believe in themselves, but that they find their school experience boring. While most students have a positive outlook on themselves and their potential, they feel undervalued in school and often don’t see the relevance of what they are learning to the outside world. Disengagement tends to be a gradual process, with interest in and excitement about school waning over time. According to the Canadian Education Association’s What did you do in school today? research initiative, which has surveyed over 60,000 Canadian students since 2007, the percentage of students engaged in their learning drops from 82% in grade 5 to a mere 45% in grade 12. Schools do not have the support they need to effectively teach for today, let alone tomorrow. Imagine if they were part of a global network of future-forward schools determined to rise to the challenge of true 21st century teaching and learning. Connecting these schools would enable them to challenge each other to serve and include every learner, to celebrate achievements beyond just test scores, and to collaborate in learning about and taking action on issues that matter - and this is why we've launched Future Friendly Schools. If you'd like to hear the full founding story and triggers for the program, you can watch a keynote presentation given to the Discovery Channel's Educator Network conference last year (see Materials section). During some initial conversations with educators and administrators of schools, we received consistently positive feedback that developing a certification through an inclusive process would play an important role in helping to raise the profile of the value areas being assessed. Before jumping into the process of designing the certification itself, we were able to benefit from the insights of several members of the steering committee who provided one-on-one insights based on their experiences with creating or seeking certifications. In particular, Lee Fertig at the Graded School in Sao Paulo provided a great overview of a certification his school participates in, and Bob Poole from International Baccalaureate made connections to several IB schools to gain their input. Steve Bibla from the Toronto District School Board, who authored the EcoSchools Certification Guide, provided valuable guidance on establishing the mechanics of the certification, particularly through sharing their experience of requiring top-level schools to have several years of demonstrated commitment before earning the “Platinum” level, and the importance of an annual certification process. In 2007, UserVoice as founded as a start-up in Silicon Valley with a mission of assisting organizations to collect and benefit from user-driven insights into how they could design or improve their products and services. Fortune 500 companies like Dell and Starbucks have used similar models of customer engagement - Dell’s IdeaStorm site has received over 19,000 submissions and more than 700,000 votes. When thinking about creating this certification, we knew it would be key to ensure that it wasn’t just an echo chamber of us coming up with indicators based on primarily our own experience in program development and education. The generous folks at UserVoice had donated their platform for our use at TakingITGlobal, and we couldn’t think of a better way to implement a participatory design process for Future Friendly Schools, and highlight the value of Student Voice: we would create a UserVoice site to allow anyone, anywhere in the world, to prioritize and contribute the indicators for the certification. To seed the process with an initial set of indicators for voting and to inspire participation, we reached out to the instructors leading our online professional development courses in each of these areas, combining their suggestions with some ideas from the EcoSchools certification guide, developed by Stephen Bibla for the Toronto District School Board. We also recruited an esteemed group of advisors to form a steering committee (listed in "Credits"), who were invited to an online community where they could provide feedback on the indicators before they were “released” for public comment and “judging” through UserVoice. On February 26, 2013, the UserVoice site was launched and promoted over the following weeks with an e-mail blast to TakingITGlobal’s network of members and educators, along with the networks of many of the steering committee members. The UserVoice process resulted in over 4,000 votes and 140 new ideas submitted for consideration by the community and our team. To assign the weightings to the elements, we surveyed our steering committee to balance the elements with their input, resulting in several revisions to my initial thoughts about weighting, as documented in the table above. This process led us to adopt 2-3 indicators for each Principle within the value areas, which will be incorporated into a survey to be provided to students and educators at participating schools. A key element of the program will be public school profiles, showcasing highlights from each school’s evidence submissions, and offering a public glimpse into the good practices that help to communicate the core principles in each value area, and also fostering increased knowledge sharing amongst the community. This idea was inspired by diy.org, a new initiative for youth to develop real-world skills, with a similar model of showcasing evidence through a public gallery of videos and photos. While we're sure that some schools may initially be unsure about this public display of their practices, we are convinced that the positive attention, comments and “likes” that these submissions will receive will enable them to see the value of more open sharing over time. We wanted to ensure diverse voices in our UserVoice-driven participatory design process from a broad array of stakeholder groups and countries. To ensure this goal was met, we promoted the opportunity to more than 200,000 TakingITGlobal members from nearly every country on the planet, facilitated participation at a number of events around the world, worked with partners to promote the opportunity to their networks, and asked our steering committee to reach out to their diverse networks to broaden reach. In the end, we successfully engaged more than 4,000 individuals from 157 countries to vote and provide input, and attracted more than 140 new ideas for indicators, 11 of which became the building blocks of the program's 15 principles. We knew it was essential to create a pathway for equitable access to enable participation from educators and schools without the financial resources to contribute to a sustainablity model for the program. To accomplish this, we built a pricing structure that requests an increased contribution from well-resourced privately-funded schools, who in turn "adopt" a school without financial resources to participate free of charge. Schools can identify this "sister school" from their own network, or have a match made from our network. We wanted to ensure that the practices and stories shared by schools had broad benefit. To support this goal, we have built a public portfolio system where each participating school will showcase at least one practice (lesson plans, student work, videos, photos) aligned to each of the program's 15 value areas. We are requesting that all evidence shared is provided with a Creative Commons license, to enable others to build on and re-use the practices shared. A 78% increase (47% to 84%) in readiness to create a culture of global leadership, in which students are empowered to engage in controversial global issues and create positive change. We are actively collaborating with the founding cohort of schools to capture outcomes and benefits of their renewed focus on the Future Friendly Schools value areas, and hope to publish these insights in the coming years. From a broad organizational management perspective, the UserVoice platform-driven process we utilized is a strong tool to support employee and/or stakeholder engagement, especially when designing a new product or policy. It's important to consider and communicate how you will use the input and by when, and to engage even with unpopular or controversial input - perhaps providing insight into the challenges behind those suggestions. 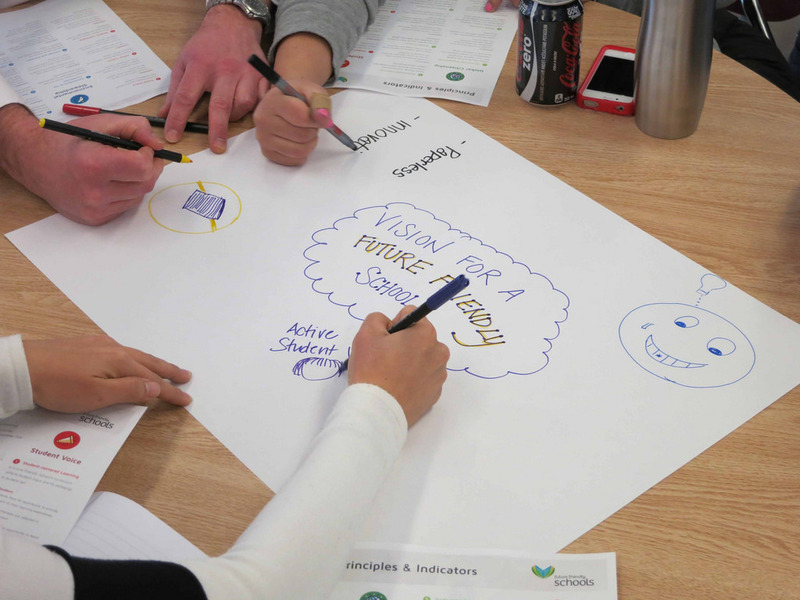 From an educational perspective, we hope that our innovation sheds light on the opportunity to align an school's values to those we've shared (Global Citizenship, Student Voice, and Environmental Stewardship) as a way to drive increased engagement and attachment. In particular, they enable three critical ingredients to an engaging learning experience: Relevance, Authenticity, and Depth. How would your school answer these questions? Relevance: How do we ensure learning provides opportunities for real-world problem solving? Authenticity: What opportunities do we provide for outcomes to be showcased or recognized by a local and global audience? Depth: Do we offer ways to extend learner engagement beyond the curriculum and school day? Balmford, Andrew, Lizzie Clegg, Tim Coulson, and Jennie Taylor. “Why Conservationists Should Heed Pokémon.” Science Magazine 295, no. 5564. March 29, 2002. http://bioteach.ubc.ca/TeachingResources/GeneralScience/PokemonWildlife.pdf. Bridgeland, John M., John J. DiIulio, Jr., and Karen Burke Morison. The Silent Epidemic: Perspectives of High School Dropouts. A report from Civic Enterprises in association with Peter D. Hart Research Associates for the Bill & Melinda Gates Foundation, 2006. http://www.ignitelearning.com/pdf/TheSilentEpidemic3-06FINAL.pdf. Coyle, Kevin. Environmental Literacy in America: What Ten Years of NEETF/Roper Research and Related Studies Say About Environmental Literacy in the U.S. Washington, DC: The National Environmental Education and Training Foundation, 2005. http://www.neefusa.org/pdf/ELR2005.pdf. Dunleavey, Jodene (Canadian Education Association) and J. Douglas Willms (Canadian Research Institute for Social Policy, University of New Brunswick). Are Canadian Students Engaged? 2011. http://www.cea-ace.ca/sites/cea-ace.ca/files/cea-2011-wdydist-infographic.pdf. Gallagher, S.A., Stepien, W.J., Rosenthal, H. The effects of problem-based learning on problem solving. Gifted Child Quarterly, 1992. 36, 195-200. Geier, R., Blumenfeld, P.C., Marx, R.W., Krajcik, J.S., Fishman, B., Soloway, E., & Clay-Chambers, J. Standardized test outcomes for students engaged in inquiry-based science curricula in the context of urban reform. Journal of Research in Science Teaching, 2008. 45(8), 922-939. Karsenti, Thierry and Simon Collin. Benefits and Challenges of Using Laptops in Primary and Secondary School: An Investigation at the Eastern Townships School Board. Montreal, QC: Le Centre de recherche interuniversitaire sur la formation et la profession enseignante (CRIFPE), 2011. http://www.etsb.qc.ca/media/etsb_pdf.file/en-CA/Report%20English.pdf. Lynch, S., Kuipers, JU., Pyke, C., & Szesze, M. Examining the effects of a highly rated science curriculum unit on diverse students: Results from a planning grant. Journal of Research in Science Teaching, 2005. 42, 921-946. Yair, Gad. “Reforming Motivation: How the Structure of Instruction Affects Students’ Learning Experiences.” British Education Research Journal 26, no. 2 (2000): 191–210.